An explosive album combining intense spoken word with some of the baddest mutha’s armed with instruments today – Live music and poignant lyricism are back with a bang! Rocking harder than diamonds and funkier than feet, baby. Get some! 2. Being Me Is the Sh--! Think Fishbone meets Gil Scott Heron as Discopoet Khari B. taps into Chicago’s phenomenally talented arts scene to pull out an assembly of the city’s most outstanding musicians. Bringing Metal fury to an unmistakable Funk feel, together these artists have created a monstrous blend that will push the limits of what is considered Spoken Word with a level of intensity rarely seen in this genre. With all original compositions and a deafening, powerful sound interwoven into some of Khari B.’s most unapologetic, aggressive work ever, this album is sure to go down in infamous notoriety. 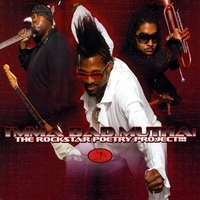 I’MMA BAD MUTHA: Rockstar Poetry Project!! !” is a live instrument experiment and studio album presented by Discopoetry Arts & Edutainment Collective. The project brings together a ferocious 12-piece Funk/Rock ensemble including gifted guitarist/producer Frankie Blaze (Crucial Conflict/WE HIT), James "Cuz" Thomas (drums), Jeff Harris (bass), Aum Mu Ra (guitar), Khari Lemuel (cello), Corey Wilkes (trumpet), Kevin Nabors (sax), & Mwata Bowden (bari sax) with Tina Howell, ZPia Renee & Saalik Ziyad (vocals), complimented by the explosive poetic persona of Discopoet Khari B. Spoken Word impressario, Miss Kimm also appears as a guest artist on "Mater Domina". The Rockstar Poetry Project is the culminating event to a series of live shows and arts experiences known primarily to the influencer segment for years. What began as a musical spark circa 2006 at Chicago’s HotHouse performance venue is now a complete studio album filled with all new and original material. Fans and newbies alike are in store for a completely multi-sensory music experience. We sincerely thank you in your interest, support, purchase and love of this album. We hope 2 B the song on your lips and banging out of your cars 4 years 2 come. Stay tuned. We've got so much more! Two years ago we were both walking on the 9 (79th street and King Dr.), Discopoet Khari B told me he and his band would be at the Kenmore Place downtown. They would be the band/entertainment coupled with the host Chef. Food, food, food, yes I would be there. As a poet, I have known Khari B, at a distance for years.... at Kenmore, although he and the band were positioned a level above our heads, I never felt so close! Talk about a banging band!!!! Man oh man, was I impressed!!!! His energy, their energy, the endless spiral of sound what a lift! The Rockstar rocked!!!! And I appreciated Mr.B taking time to be interviewed on my radio show -WCSU's iHeart radio "Cafe Yeye" in 2011.